Is it a camera? Is it a camcorder? No it's an ultra hybrid super-corder! Is size and weight this camera's biggest downfall? We were visited by a well-known highstreet Camera retailer today, which came down to show off all the brand new cameras it’ll be selling this summer. Among the cameras they brought with them were compact models including the Canon 82 IS, the Panasonic DMC-TZ5, the Sony Cyber-shot W170 and the Olympus Mju 850. But what we were most pleased to see was the Casio Exilim Pro EX-F1. While not a DSLR, it’s still one of the most astounding digital cameras we’ve ever laid our hands on. Because while this aims to be a top-notch 6MP (that’s a max resolution of 2,816 x 2,112) digital camera, it’s also masquerading as a semi-professional video camera – and doing a damn good job of it, too. It can shoot video at up to 1,200 frames per second, which frankly, is astonishing. At that speed though, the images produced are severely compromised in terms of resolution, but even at 300fps (still very quick) the videos look fantastic. The Exilim EX-F1’s high speed CMOS sensor is capable of snapping full-resolution photos at a rate of 60 every second. That means it’s almost impossible to not get a perfect snap of your baby’s first smile or your kitten jumping in the air. The pre-record setting is handy for this also. We tried it out and when this feature is turned on, it will capture a burst of still photos before you’ve even pressed the shutter button. And that means that even if you’re slightly late hitting the button, you’ll still get that perfect pic. We did a few test shots and found these two modes absolutely idiot proof. It’s very hard to not get the shot you want, which is both reassuring and immensely satisfying at the same time. 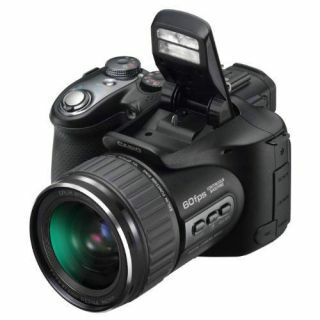 The EX-F1 also has a 12x optical zoom which is great for getting in nice and tight. Plus it’s got all the latest must-have camera features like face recognition, and a 2.8-inch LCD view screen. Everyone on the TechRadar team thought it was a fantastic camera. But it’s not without its drawbacks. For a start, it’s one of the biggest, most chunky digital cameras we’ve seen in recent years. It weighs nearly 700g and we measured it at 128x80x130mm. Anyone with particularly small hands will struggle to weird this shooter with any real skill. So while we’d all love a brilliant digital camera like this one, that can also record video at full HD resolution, its back-breaking weight and awkward dimensions make it a bit of a dilemma. The price of over £500 only makes it an even tougher call.